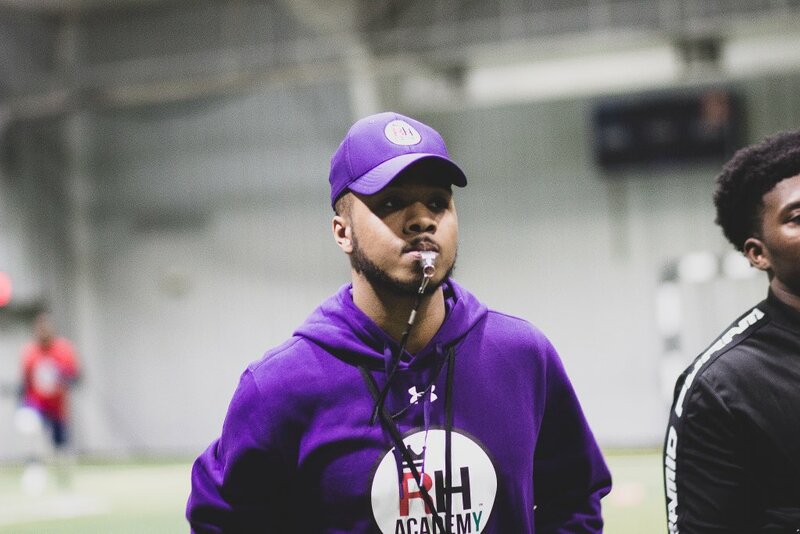 Bowie State grad student Aaron Campbell founded Respect and Honor Academy to help student athletes realize they have more to offer than sports. Student-athletes live and breathe the game. You have a ball in your hand by the time you turn six. You play quite literally all your life; dedicating all of your high school and collegiate career to the game. For a vast majority of players, though, that unsettling reality sets in after the clock hits “final” on that last game of senior year… what now? Who am I outside of this? Going professional indeed is the goal, but how many student athletes have another plan or passion if going big unfortunately doesn’t work out? Moreover, how many people around them are encouraging growth and knowledge outside of the game? The thought processes regarding the future for student athletes can be very black and white; you “make it” or you don’t. As a former student athlete himself, Campbell reflected on seeing former teammates go down non-fulfilling paths and his feelings of not knowing himself, his talents or capabilities. Unsettled with this being the norm, Campbell partnered with like-minded individuals to brainstorm on ways to change the narrative. Together, the team found the inspiration to change the landscape for current and future student athletes. Thus, Respect & Honor Academy was born. R&H Academy is more than a football training organization. This non-profit program creates a foundation for student athletes with courses including but not limited to personal and character development, financial literacy, male leadership, credit recovery, entrepreneurship, and career development outside of playing sports. “…Put young people in a position to understand that they’re more than an athlete, that they have more to offer the world than just their physical talent, but that they’re smart, they’re intellectuals, they’re creatives, that they can be anything they put their mind to,” Campbell said. A huge shoutout and congratulations to @CoachAaronRHA and the amazing @RHAcademy_ program. Outside of the personal development, R&H Academy is putting in more overdue work for student athletes by emphasizing opportunities at HBCUs. R&H provides college tours and has made stops at Morgan State University and Bowie State University in the past two years. They plan to continue touring this year with a big surprise in store for the students. When discussing and visiting HBCUs, the goal is to reprogram students’ thought process of bias if need-be and provide clarity that outside of popular belief, they can be a successful athlete anywhere. The HBCU impact in RH Academy does not just touch the prospects, though. Outside of Campbell being a grad student at Bowie State, running backs coach Joseph Ukwu played for Morgan State, while linebackers coach Delante “Rook” White played at BSU as well. Similarly to Campbell, White is using his own experiences to pay it forward on and off the field. Not only is he interacting with the students during drills, he is also making sure students come out of school prepared for the future. The R&H Academy held the Premiere on March 9. The Premier combine was open to student-athletes grades 9-11 and high school seniors that had not signed a letter of intent. The combine experience was thorough, including a 40-yard dash, position-specific drills, one-versus-one competitions and MVP awards at the conclusion of the ceremony. This opportunity gave student-athletes the chance to get looks from schools, network, and possibly get recruited. The event hosted over 100 athletes in the D.C-Metropolitan area and welcomed over 20 schools including representatives from local HBCUs Virginia Union and BSU. The Premier was created to give athletes a chance they may not have been afforded otherwise. Many athletes believed their dreams of going professional was slowly coming to an end due to little to no recruitment and exposure, so this event fulfilled those needs. Beyond school presence, several national media platforms sent representatives including HBCU Gameday, ESPNU and 247Sports. “That was the biggest event to ever take place in the DMV area by a local company, nobody has ever done that,” Campbell said. R&H Academy is a 501c3 non-profit organization. If you would like to donate, you can find their GoFundMe initiative here.